A mom willing to let him have one. That being said, you should choose a dog breed carefully. Although all dogs can be good with kids in the family they have been raised with, not all breeds are perfect companions for children. You do not want to invite any untoward incident in your life and this can be completely avoided by choosing the right dog breed for your kid. To be 100% safe and sure, choose a Boxer or a Lab. For a wider choice, have a look through the list of best dog breeds for kids. Why does every kid need a dog? What we should want most for our kids is to be able to learn right on their own. Because if they can, then we don’t need to teach them everything. Having a dog as a companion can encourage kids to learn many things on their own. We had no idea what the world had in store for us and we still don’t. We never do. We have never been good at predicting the future. Raising and educating our kids as if we have any idea what the future will hold is not the smartest notion. Dogs provide perfect earthing for our imperfections. It is necessary for the child to have time away from their parents and a dog is a perfect companion at such times. Many parents coddle their kids, keeping them on a leash, making them rely on their presence for happiness. When kids grow up, they don’t know how to be happy. They must immediately attach to a boyfriend, girlfriend or friends. Failing that, they find happiness in other external things – shopping, food, video games, the Internet. But if a child learns from an early age that he can be happy by himself, playing with his dog and reading and imagining, he has one of the most valuable skills there is. Pets can be great companions for children, but they might not always treat each other gently. Having a patient dog like a boxer or a lab can imbibe these teachings at a young age. Dogs can be a perfect balance between schooling and homeschooling. To some extent, unschooling kids is an overlooked requirement. Kids need to be taught to learn on their own, without us handing knowledge down to them and testing them on that knowledge. Owning a dog will provide priceless learning opportunities, unexpected problems, many opportunities to learn, opportunities to find out, without relying on established methods that might not be optimal. Kids need to learn to adapt, to deal with change, to be prepared for anything by not preparing them for anything specific. Having a dog provides the perfect need to varying demands and responsibilities. Training a dog is a challenge worth working hard for. This can be a very interesting activity for your kid. A kid who can train his dog needs to learn many lessons in the process including patience. Kids witness loyalty and unconditional love when there is a dog in the family. Feeding a dog is a responsibility every kid should shoulder. If a child can solve problems, the child can do any job. Owning a dog might be intimidating to any of us, but really it’s just another problem to be solved. A new skill, a new environment, a new need – they’re all simply problems to be solved. Teach your child to solve problems by modeling simple problem solving, then allowing them to do some very easy ones on their own. Don’t immediately solve all your child’s problems – let them fiddle with them and try various possible solutions, and reward such efforts. Owning a dog will provide a chance to your child to develop confidence in their problem-solving abilities. What drives us is not goals, not discipline, not external motivation, not reward but passion – having a dog will ignite a passion in your child. Kids should be taught to increasingly stand on their own. A little at a time, of course. Slowly encourage them to complete all dog responsibilities on their own. Teach them how to do it, model it, help them do it, then let them make their own mistakes. Playtimes can be made interesting. Cooking food for a dog can be an interesting daily project for kids. Acquiring basic cooking skills will be a huge help later in life. Kids involved in the kitchen are likely to eat healthier, try more new foods and less likely to be picky eaters. In addition to developmental skills, having a safe space to play with dogs and knowing other dog owners are things that will influence when kids will learn. The strongest skills and habits we have are usually formed early in life. Having a dog in the house can make life more interesting and less boring. As soon as your kid is old enough to get an allowance and understand how money works, they’re old enough to start picking up financial skills. Shopping for the dog can be a good responsibility for your kid. Young kids probably aren’t able to walk the dog without supervision, but they certainly can help out with it. 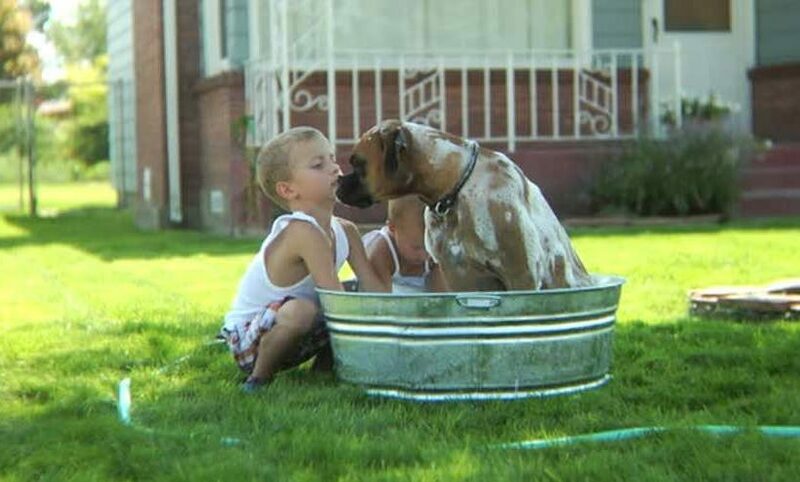 Kids can help out with bathing the dog and this is a fun activity for kids. Kids can start walking friendly dog breeds by themselves at age 12 and above. 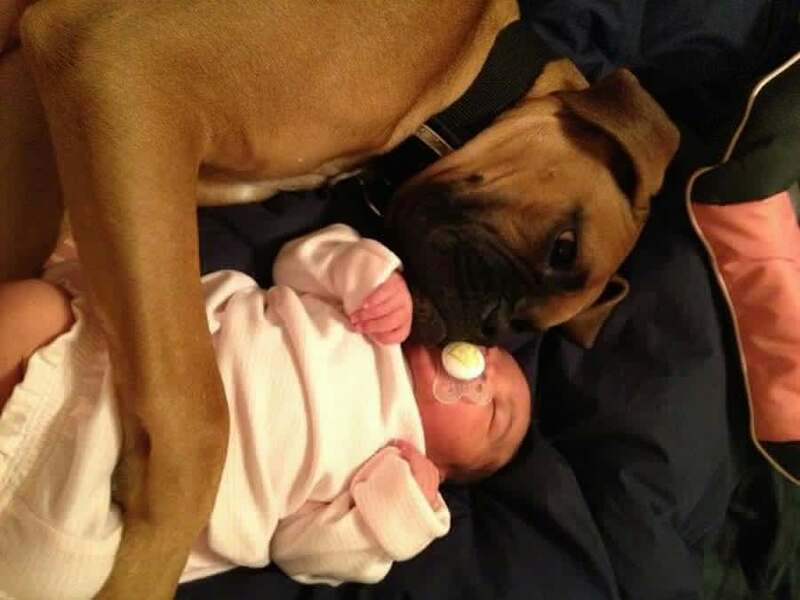 Some dog breeds can almost babysit.